Those who seek independence can indeed be divided into two camps. There are those who believe that all the decisions must be taken and all the problems must be solved before we can even think about independence. There are those who believe we must have independence first, because only then can we start to take all the decisions and solve all the problems. I put myself in the second category. I believe it's the only way, because if you try to resolve every issue before thinking of independence, you'll never get there. Every day brings fresh challenges, new decisions to be taken, new problems to be solved. When will we ever know that we've done everything? If you want take every decision before independence, when can you ever be sure you've done enough to be in a position to take that big step? Absolutely correct. The certainty that unionists insist on is an impossibility. And they know it. All of politics is compromise. It's always a question of weighing the gains against the losses. 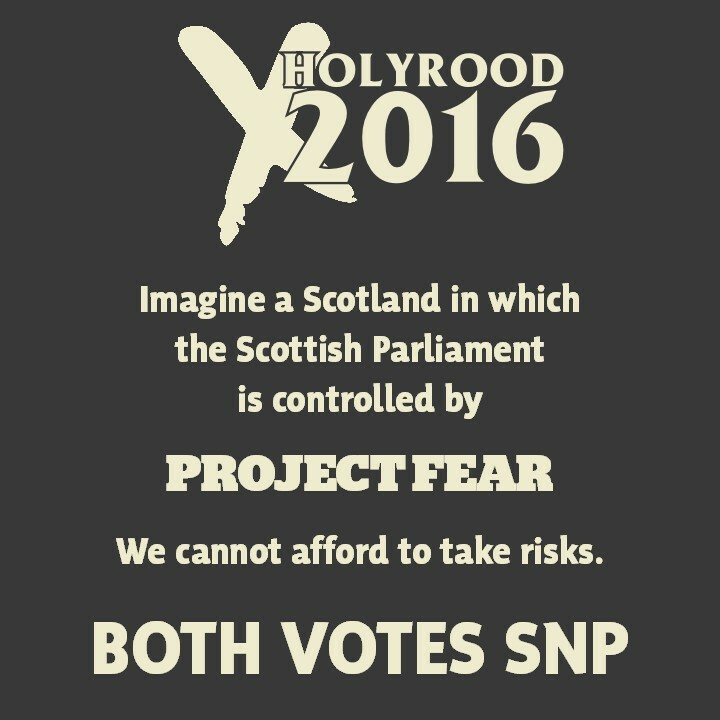 The one certainty that I do have is that independence would not be the sky-collapsing catastrophe foretold by Project Fear. Such inane scaremongering is founded on the assumption that Scotland is an exception among all the nations of the world. That the normal rules of politics and economics - to the extent that there are any - don't apply to Scotland. That we are uniquely incapable of being as other nations. Scotland only needs to be ordinary to be independent. I reckon we can manage ordinary. 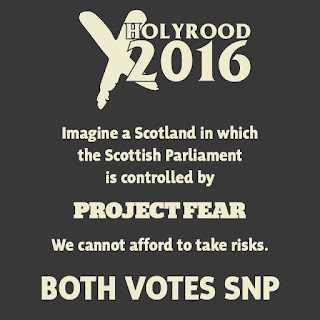 At the risk of appearing a bit stupid, I am struggling to arrive at my own pithy 2-liner to use through the next couple of months that will allow me to make a powerful #2votesSNP argument to those that are near and dear to me and to whom the idea of independence per se is a vomit-inducing fearsome thing. This includes NHS workers who volunteer that NS was by far the best health minister worked under, whether in England or Scotland... it includes also small business(men)who may admire the SNP clarity and attention to detail but still baulk at the independence thing. These are people who have likely never voted SNP, but they are people I consider important to all of our futures. The following might suffice. Or, at least, provide a starting point. "I seek for Scotland no more than that status and those powers which other nations assume to be theirs by right." Nice and pithy indeed, thanks.